The spur-winged goose (Plectropterus gambensis) is a large bird in the family Anatidae, related to the geese and the shelducks, but distinct from both of these in a number of anatomical features, and therefore treated in its own subfamily, the Plectropterinae. It occurs in wetlands throughout sub-Saharan Africa. Adults are 75–115 cm (30–45 in) long and weigh on average 4–6.8 kg (8.8–15.0 lb), rarely up to 10 kg (22 lb), with males noticeably larger than the females. The wingspan can range from 150 to 200 cm (59 to 79 in). One source claims the average weight of males is around 6 kg (13 lb) and the weight of females is around 4.7 kg (10 lb). However, 11 geese of this species banded in South Africa were found to average only 3.87 kg (8.5 lb), with a range of 2.4 to 5.4 kg (5.3 to 11.9 lb). Another study in South Africa found that 58 males weighed an average of 5.52 kg (12.2 lb) and measured 98.1 cm (38.6 in) in total length; while 34 females averaged 3.35 kg (7.4 lb) in weight and 84.2 cm (33.1 in) in total length. Among standard measurements, the wing chord is 42.5 to 55 cm (16.7 to 21.7 in), the bill is 5.7 to 6.4 cm (2.2 to 2.5 in) and the tarsus is 5.7 to 12 cm (2.2 to 4.7 in). They are the largest African waterfowl and are, on average, the world's largest wild "goose", although in average weight, their size is at least rivaled by the Cape Barren goose. Spur-winged geese appear to be more closely allied to shelducks than "true geese" such as those from the Branta and Anser genera. They are mainly black, with a white face and large white wing patches. The long legs are flesh-coloured. The nominate race P. g. gambensis has extensive white on the belly and flanks, but the smaller-bodied subspecies P. g. niger, which occurs south of the Zambezi River, has only a small white belly patch. From a distance, P. g. niger can appear to be all black. The male differs from the female, not only in size, but also in having a larger red facial patch extending back from the red bill, and a knob at the base of the upper mandible. This is generally a quiet species. Typically, only males make a call, which consists of a soft bubbling cherwit when taking wing or alarmed. During breeding displays or in instances of alarm, both sexes may utter other inconspicuous calls. This bird is often poisonous due to its diet of blister beetles. The poison, cantharidin, is held within the tissue of the fowl resulting in poisoning of those that eat the cooked goose. 10 mg of cantharidin can kill a human. This species often occurs in open grasslands with lakes, seasonal pools, rivers, swamps and river deltas. Large inland rivers and lakes are perhaps most commonly inhabited, with saline lakes and upland areas generally being avoided, although the species can occur to an elevation of 3,000 m (9,800 ft) in eastern Africa. It is also absent from arid zones. The spur-winged goose is gregarious, generally meeting in small flocks that contain up to 50 birds. They occur around various African rivers, lakes and swamps. Varied sites may be used for post-breeding moulting, in which case large numbers of the geese may congregate. This common species feeds by grazing, but spends the middle part of the day resting by water. Its diet consists predominantly of plant matter such as the vegetative parts and seeds of grasses, sedges and aquatic plants, agricultural grains, fruit (e.g. figs) and tuberous crops, although it may occasionally supplement the diet with small fish or insects. Dispersal may occur in pursuit of feeding opportunities outside of the breeding season. The breeding season for spur-winged geese is variable across the range. In the north, breeding generally occurs from August to December, in eastern Africa from January to June and in southern Africa from August to May. This species is highly aggressive to other waterfowl (including conspecifics) during the breeding season. At this time of the year, the geese may violently put the spur on the bend of the wings to use in conflicts with other birds. Adult male geese are especially prone to attacking other adult males. The large nest is usually concealed in vegetation near water, but tree holes, cavities in rocks, old hamerkop, African fish eagle or social weaver nests and even the top of a termite mound and an aardvark burrow have been used as nests. When choosing a tree-nest site, they will generally select a nest located close to the ground at between 20 and 100 cm (7.9 and 39.4 in) high in trees 3 to 4 m (9.8 to 13.1 ft) high. Generally, they prefer quiet, undisturbed stretches of riverbank and wetlands for nest sites. 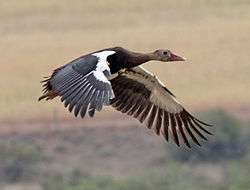 The spur-winged goose is a common bird of African wetlands. Perhaps the main threat to the species is development and destruction of wetland habitats and unregulated hunting. A counting survey of the population in western Africa wetlands from Senegal to Chad in early 1977 produced a count of 10,000 geese, mostly being found in the Niger basin. This bird is one of the species to which the Agreement on the Conservation of African-Eurasian Migratory Waterbirds (AEWA) applies. ↑ BirdLife International (2012). "Plectropterus gambensis". IUCN Red List of Threatened Species. Version 2013.2. International Union for Conservation of Nature. Retrieved 26 November 2013. 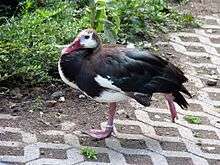 ↑ "Spur-winged Goose - Plectropterus gambensis : WAZA : World Association of Zoos and Aquariums". WAZA. Retrieved 2011-10-17. ↑ Garst, Warren & Genevieve (Genny) (2010-02-09). "Spur-winged goose sitting in water". Garst Wildlife Photographic Collection. Colorado State University. Retrieved 2011-10-17. ↑ "Plectropterus gambensis- Spur-winged goose (Species)". Wildpro. Retrieved 2011-10-18. 1 2 3 4 5 6 7 8 9 Madge, Steve; Burn, Hilary (1988). Waterfowl: an Identification Guide to the Ducks, Geese, and Swans of the World. Boston: Houghton Mifflin. pp. 160–161. ISBN 0-395-46727-6. 1 2 CRC Handbook of Avian Body Masses, 2nd Edition by John B. Dunning Jr. (Editor). CRC Press (2008), ISBN 978-1-4200-6444-5. ↑ Halse, S. A., & Skead, D. M. (1983). Wing moult, body measurements and condition indices of spur-winged geese. Wildfowl, 34(34), 108-114. 1 2 del Hoyo, J; Elliot, A; Sargatal, J (1996). Handbook of the Birds of the World. 3. Barcelona: Lynx Edicions. ISBN 84-87334-20-2. Sinclair, Ian; Hockey, Phil; Tarboton, Warwick (2002). SASOL Birds of Southern Africa. Struik. ISBN 1-86872-721-1.